Mum knows best and when it comes to photographing this royal baby, that really is the case. The Duchess of Cambridge has stepped behind the lens to take the latest official snaps of her daughter, Charlotte, and the results are really rather lovely. 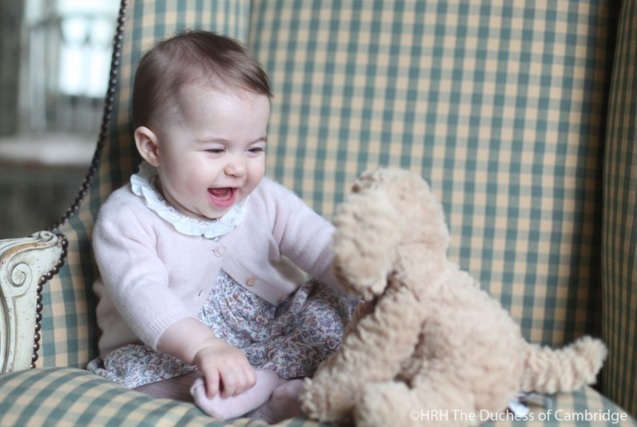 Taking everyone by surprise, Kensington Palace released two new images of the baby princess via Twitter on Sunday. The stand out sot is of the fourth in line to the throne playing with a cuddly toy with a total look of glee on her face. The other image shows Charlotte Elizabeth Diana in pensive mood, perched on a chair at the family's Norfolk home, Anmer Hall. It's the first time Charlotte has been captured on camera since her christening photographs back in July when she posed, sort of, for world famous snapper Mario Testino. Queen Maxima visited Bangladesh in the week and although there were limited photos of her time in the country, there was no doubting from the few that came through that this consort was keeping it colourful on her trip made in her capacity as a special advocate for the Secretary General of the United Nations on inclusive finance. The brightest of her bursts of colour was worn for a visit to a clothing factory where she heard from workers about the advantages to them of being paid their salaries via digital systems. Her dress, with its fuchsia top and peach skirt, matched the vibrant colours of the environment well. For her arrival in Bangladesh, Maxima chose a red dress with orange and white patterning and an orange collar matched with a favourite pair of red and clear shoes. We got three Kate looks this week plus one of her famous sports casual moments thrown into the mix for good measure. And autumn has definitely arrived at Anmer Hall - apart from a burst of blue, this duchess was reaching for the muted shades as the year fades to grey. Kate started her week at the Fostering Network awards in London where she chose a royal blue dress by Saloni with a slightly flared skirt and a crinkle effect. Whether it was chosen to match the frock picked by TV star, Holly Willoughby, will remain a mystery but they did complement each other rather well. 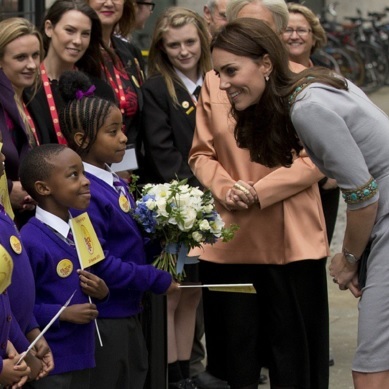 The following day, Kate was in London for a headteachers conference organised by Place2Be of which she is patron. For this high profile event, at which the Duchess of Cambridge made a speech, she recycled a Matthew Williamson grey dress with a peplum at the waist and ornate beading around the neck and sleeves. There was a big fashion focus on Spain's Royal Palace this week as that modern style icon, Letizia, welcomed the original 21st century queen of elegance, Rania of Jordan. And as well as the meeting of fashion minds, the newest consort on the continent also had several other engagements which allowed her to dive into every corner of her royal wardrobe. Letizia started quietly with a navy trouser suit and purple blouse that has been worn many times before but suited her visit to the Women of Africa forum in Madrid to perfection. But she was given a lesson in smart suits by her mother in law, Queen Sofia, who attended an event marking the 50th anniversary of a maternal and child health hospital in Madrid in a super smart grey dress with pleated skirt and matching jacket. Autumnal elegance at its best. 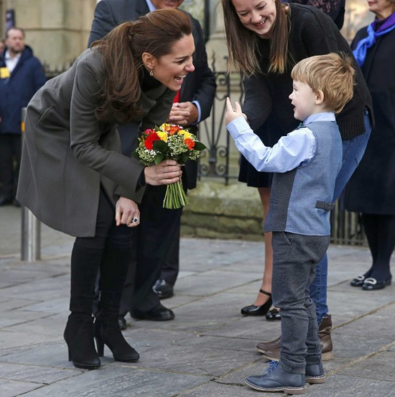 The Duke and Duchess of Cambridge have spent the day in north Wales in a series of engagements that scaled the heights and tugged the heart strings. Kate and William started the day in Caernarfon where they stopped in at Gisda, a charity which which provides help to young homeless people with around 400 people being supported by the organisation every year. William and Kate met some of those being helped by Gisda to hear their stories. The royal couple also visited an art project established to help young people with mental health problems. The project is run by MIND and William and Kate visited a photographic exhibition put together by young people using art to voice their problems and concerns. 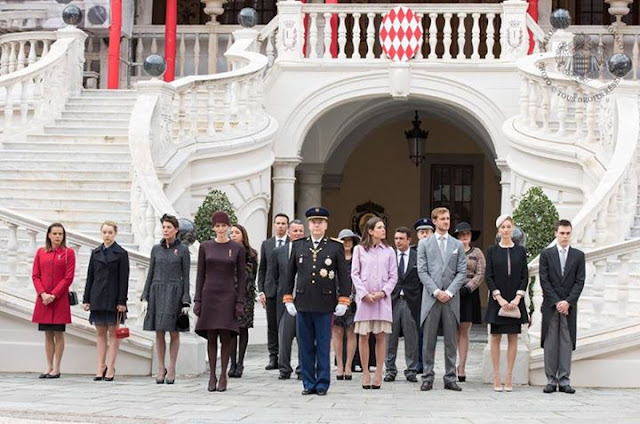 Before National Day in Monaco got under way the question was whether Jacques of Gabriella would steal the limelight. Instead, it turned out to be all about a style lesson from the two newest royal wives in Monte Carlo. Princess Charlene has done this before but motherhood has done wonders to her confidence and her new haircut and bold outfit was as surprising as it was stunning. It takes a lot to make brown work but it was no bother for this princess. From the cut of the dress to the matching tights and shoes, the whole twenties style outfit was about as perfect as could be. She added a cloche hat over a pixie cut and went straight to the top of the best dressed this year list. They have often been compared to one another and on November 19th they met face to face in Madrid. 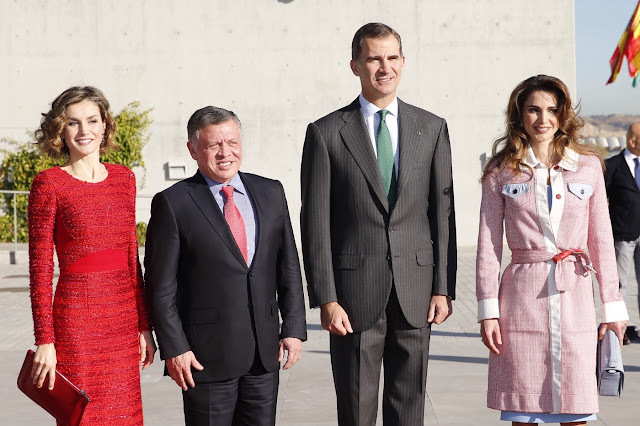 Queen Letizia of Spain played host to Queen Rania of Jordan as she and her husband, King Abdullah II, began a working visit to Spain. The first encounter was by day as Felipe and Letizia headed to the airport to offer an official welcome to their guests. And while this trip is a working one for the Jordanian king and queen, the first encounter was also a fashion fest for royal watchers as Letizia and Rania met again. This one was definitely a speech. Just hours after the Duchess of Cambridge took to the stage at the Fostering Network Awards and made a mini speech, she was back in front of the microphone talking about challenges close to her heart. And this big public appearance was all about the mental health issues that can face young people. 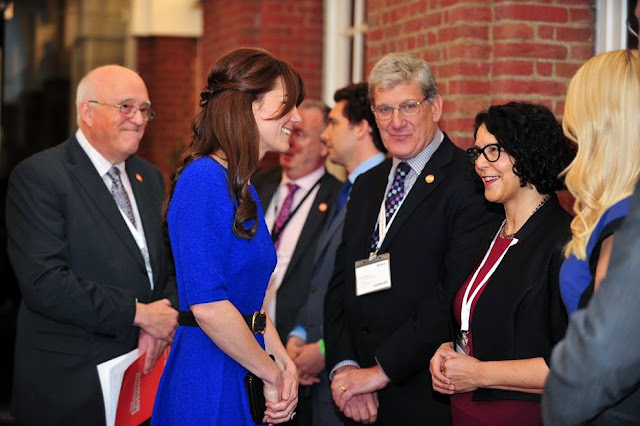 Kate was opening the Place2Be headteachers' conference in London and she told those present that getting help to vulnerable young people early was of vital importance. Kate said 'I have seen time and again that the roots of poor mental health in adulthood are almost always present in unresolved childhood challenges'. For the first time since her husband became King of Spain, Queen Letizia is to feature on a coin. The royal couple are shown on one side of a new 30 euro coin being released to mark the 400th anniversary of one of Spain's most famous literary masterpieces, Don Quixote. The coin, made of silver, shows Europe's newest king and his consort in profile on one side and on the other are images associated with the work of Cervantes. Don Quixote himself, on his beloved horse Rocinante, stands in the middle with one of the windmills he so famously tilted at also shown. Kate had a very important date in London this evening as she gave her support to the Fostering Network award. 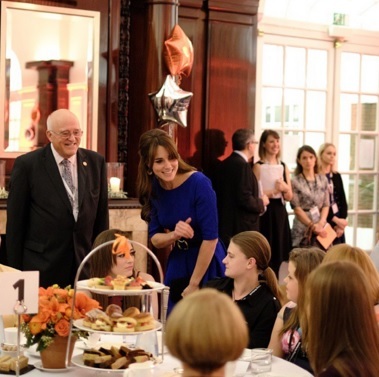 The Duchess of Cambridge tooktea tea with nominees and handed out some of the prizes. But were her words on stage enough to be classed as a speech? The annual awards celebrate the work of foster carers, social workers and young people themselves and among the prizes that Kate handed over was the Fostering Achievement Award won by Adam Howlett, Emily Bowyer and Sian Connolly. Helping the duchess celebrate was TV star, Holly Willougby, who later described Kate as 'wonderful'. 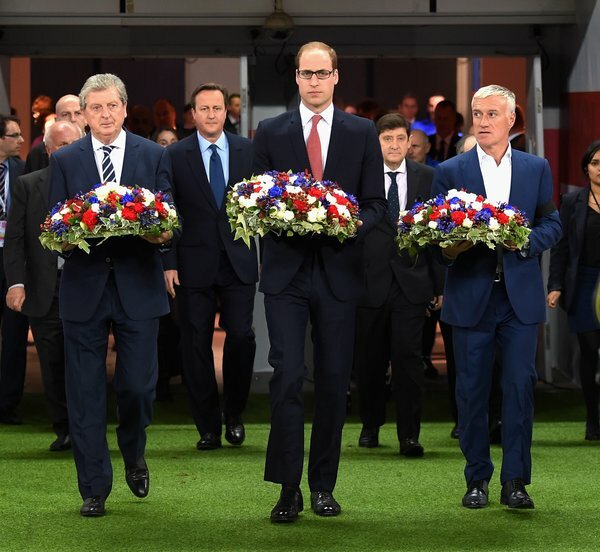 The Duke of Cambridge, President of the Football Association, has joined tributes to those killed and injured in the Paris attacks at the England-France friendly at Wembley tonight. William carried a wreath of tricolor flowers on to the pitch before the game began alongside Didier Deschamps and Roy Hodgson before the game began. William is at Wembley along with Prime Minister, David Cameron, and Leader of the Opposition, Jeremy Corbyn, to join fans from England in showing his support for the French team, its supporters and all those affected by the attacks which left 129 people dead. Wembley's famous arch was lit red, white and blue and William watched as the teams stood arm in arm and the Marsellaise rang around the stadium in an emotional tribute. As the full horror of what happened in Paris on November 13th 2015 continues to unfold, the thoughts and sympathies of people around the world are with the city. And monarchies are sending messages of condolence to the French president and expressing their support, and that of their fellow citizens, for the people of France. 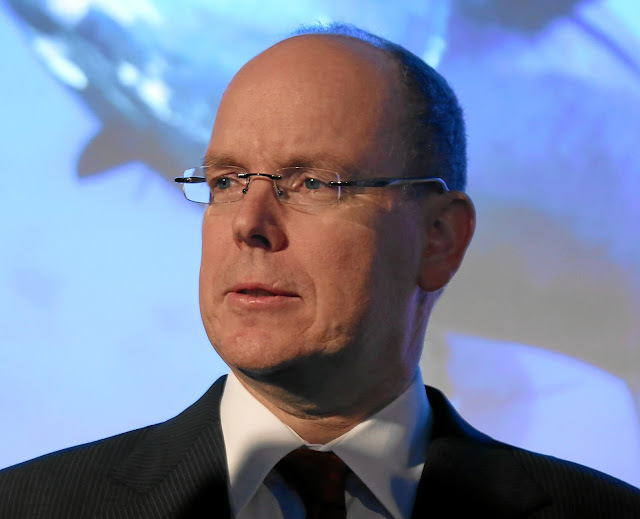 Prince Albert II of Monaco said that the attacks in Paris had revulsed him and that he, his family and the people of Monaco sent their solidarity to France. The Sovereign Prince of Monaco added that he remembered the many victims and spoke of the immense sadness of their families. And he said that, along with his family and fellow citizens, stood alongside all those opposed to terrorism. It wasn't the best result for a team hoping to make a major international competition but at least they had lots of royal support getting there. 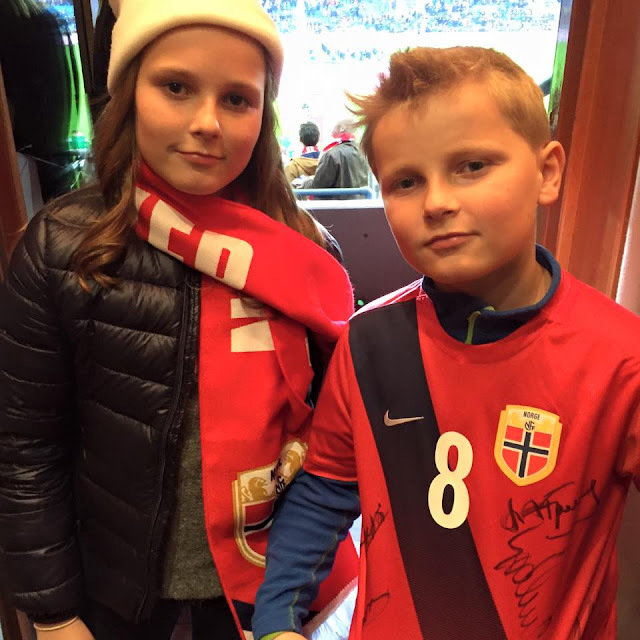 Norway lost 1-0 to Hungary in the first leg of a play off to reach Euro 2016 with a king and two monarchs in waiting watching on. You could look at the packed royal box in two ways. It was a ringing endorsement of the football team who now have a lot of work to do to reach the Euro finals. But it also meant that as the players trudged off the pitch knowing they had a mountain to climb to make the tournament they had to do it in front of most of their country's royal family and let's face it, no one wants an audience when they've had a bad day. Sophie Wessex is one of the hardest working members of the Royal Family and very often what she does goes under the radar. This time last year, William and Kate headed to New York and their stay in America made international headlines. Sophie is in the Big Apple right now but her visit has barely made news. And yet the Countess in New York is doing some important work. On Remembrance Day, Sophie paid tribute to many lives lost in moving acts filled with solemnity. 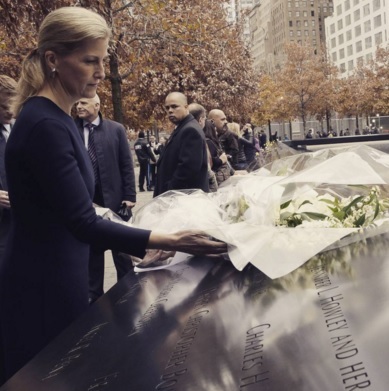 The Countess of Wessex placed a wreath at the Queen Elizabeth II Remembrance Garden in New York on a grey November 11th. There was little pomp or ceremony - instead, Sophie carried her garland of poppies into the simple garden and, having placed it amongst many others, bowed her head in remembrance.